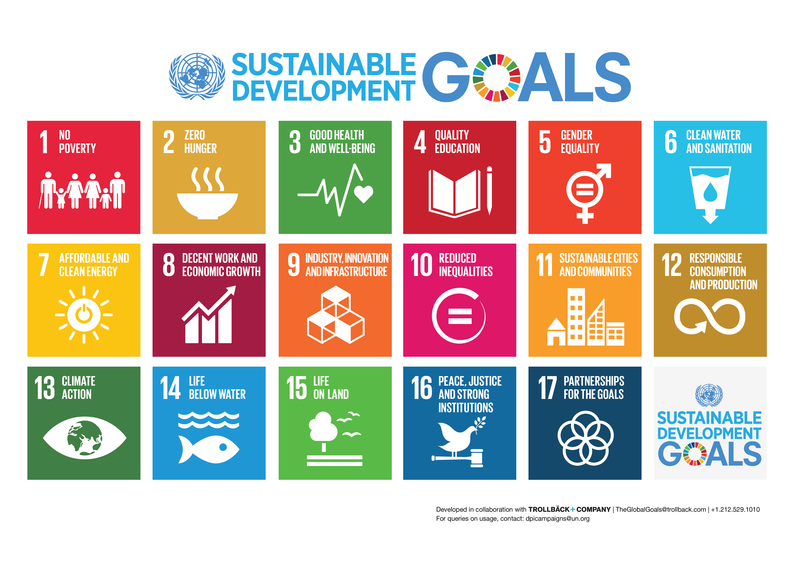 Since the release of the Sustainable Development Goals, 2015-2030 (SDGs) in mid September, the ensuing weeks have been studded with discussions addressing how to shape these targets into practicable actions that will effect meaningful change. 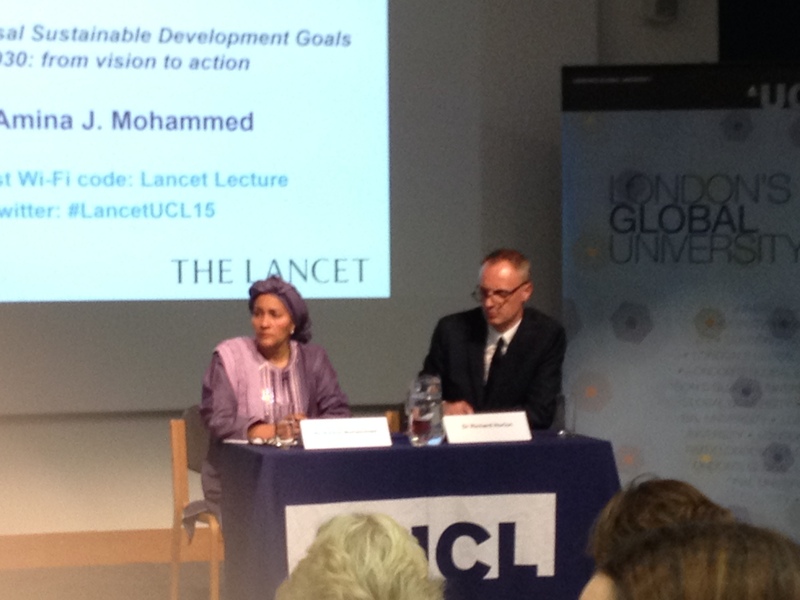 This month, the annual UCL Lancet lecture invited guest Ms. Amina J. Mohammed (Special Advisor of the Secretary-General on post-2015 Development Planning) to speak on the new universal SDGs for 2030 with the catchphrase ‘from vision to action’. What does this emotive punchline really mean? It is here useful to revisit the precursor Millennium Development Goals (MDGs) from which this sustainable development agenda has arisen. Although widely berated for being static and failing to reach imposed standards, the culmination of the MDGs heralded some success stories. Fundamentally they represent the first instance of global partnership at a time when there was no common framework for global health promotion. Indeed, over the past 20 years child mortality (dying before the age of 5) has been reduced by almost half. Arbitrarily this means about 17,000 children are saved every day. Meanwhile, globally, the maternal mortality ratio decreased by 45 per cent between 1990 and 2003. In terms of a disease specific result, the former World Health Organization (WHO) funded Roll Back Malaria Partnership has identified the fight to eliminate malaria as the cite of great progress. Indeed, between the millennium and 2012, an estimated 3.3. million deaths from malaria were averted due to substantial expansion of interventions and prophylactic programmes. Notwithstanding these burgeoning successes, the MDGs did not stand the test of time across the board. Over their duration, economic growth demanded reactive targets that accommodated inflation and trend analysis neither of which were implemented at a functional level. More importantly, perhaps, it is important to identify that what the policy-makers of the global community identify as MDG achievements are not necessarily representative of the opinions of country-level governments or civilians. 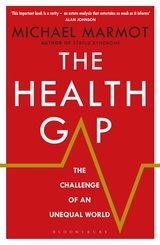 Any assessment of the MDGs and approach to the SDGs must be, as Sir Michael Marmot remarked upon publication of his latest work The Health Gap: the challenge of an unequal world, ‘culturally relevant’. To this one might add temporality and context dependent. After all, it is tricky to assess the achievements of the SDGs from our current 2015 standpoint. Instead, we must hold them to account in relation to their millennium world inception. The transition between the MDGs and the SDGs is not necessarily clear-cut and there is merit in considering the SDGs as unique goals constructed out of their time and its demands. With 17 goals, one might question whether they are sufficiently specific but, as Mohammed noted, given the many existent worldwide health dilemmas and inequalities this is, in fact, a strongly condensed working pool. These goals increasingly apply to developed countries, prioritising inclusivity of all UN member states and accessing hard to reach populations from the goal-setting process onwards which attempted to hear the voices from every societal strata. The transformative agenda of the SDGs looks at how to reach those most often forgotten while feeding a growing economy. Mohammed suggests: ‘we are not subject to the budget; we are the budget’, and as such we must be agents that simultaneously propel concrete action while protecting human rights. In spite of the single goal pertaining solely to health (Goal 3: ensure healthy lives and promote well-being for all at all ages), the SDGs are collectively co-dependent, aiming to facilitate human and animal health in our world for the long-term. This agenda is the most ambitious yet, being simultaneously conscious of approaching development through synergistic and interdependent methods while recognising the limitless nature of setting environmental targets (something Mohammed is herself just coming to terms with following her surprise recent appointment as Environment Minister for Nigeria) alongside economic, partnership, and infrastructure aims. The SDGs are about more than just ending poverty (Goal number 1: end poverty in all its forms everywhere); they are increasingly ‘planet sensitive’. The segue from the MDGs to the SDGs is marked by a question of ownership. No longer is this agenda the elitist property of the government. This time it is owned by the people, with targets of health for all everyone’s very personal business. Which goals will be prioritised at country-level cannot be definitively predicted. Country governments will focus on laws and policy-making that best pertain to the most pressing or controversial needs of their nation. Local political concerns will always trump the comparatively vague, aspirational non-context specific ideas of the SDGs. This demands a creative engagement in the goals that transcends their terminology and content bounds. Comparably, Mohammed advocates talking about health and how it informs the goals rather than focusing on it as a discipline to which only goal 3 is immediately derivative. Indeed, the SDGs are novel by responding to the United Nation member states’ express wish to manage things at the domestic level as part of a ‘global village’ which overwrites the divide between the ‘North’ and ‘South’. The SDGs seek to move from vision to action by addressing global economies and the social agenda beyond national borders guided by Secretary-General Ban Ki-moon’s fluid rather than prescriptive agenda which valued context specific goal setting. The Financing for Development workplan that was agreed at the Third International Conference held in Addis Ababa, Ethiopia considered mobilisation concerns. More than ever before, if the SDGs are to be operational rather than merely aspirational, government expenditure that goes into leveraging the capital economy will need to be supported by other monetary flows . ‘The financing framework of Addis Ababa is [according to Mohammed] doable’ and will raise awareness of the necessity of smart investment and seeing the SDGs and their achievement as more than just corporate social responsibility. 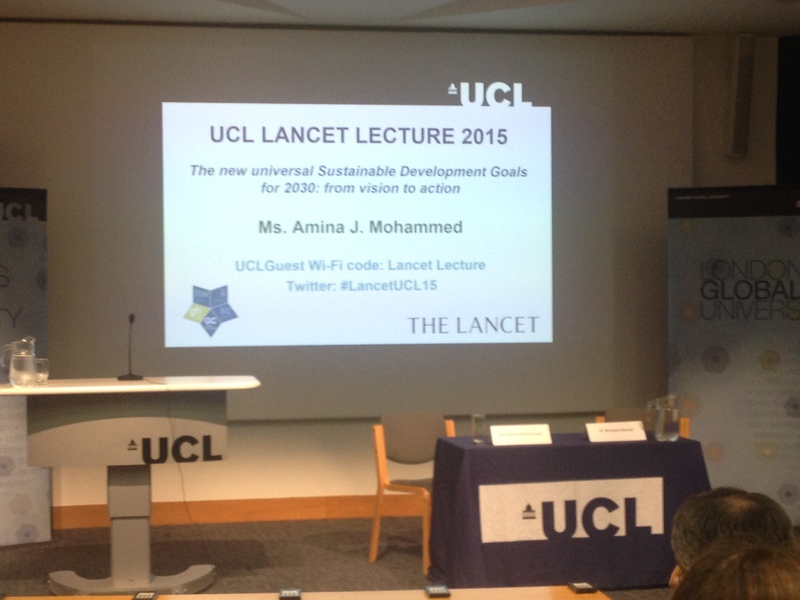 Mohammed concluded that ‘we have a shared responsibility and a shared future. […] It is about an international justice for peoples. The SDGs are transformative by showing that business as usual is not possible on the development pathway’. MdM regularly prioritises work and figures that reflect the experience of the humanitarian context. Therefore it is pertinent to ask whether the humanitarian field can be addressed in the SDG 3. This question is still being addressed. The challenge to answering this in practice and conceptually arises from how to mobilise governments at the local level to make achievable change through sustainable action. Country-based planning over the short and long-terms will perhaps indirectly meet or absorb the priorities of the humanitarian context. However, the most salient take away message from Mohammed’s lecture was that the SDGs must be fit for purpose: able to create an actionable plan for the modern world. To be temporally appropriate, a Data Revolution is an absolute priority. If we say that we do not want to leave anyone behind then we must consider where they are and who they are. Mohammed highlighted that we do not have comprehensive baseline data of peoples or fixed global indicators to measure development. Their acquisition will be essential, and will demand strategic and weighty investment enabling countries to measure their own development at a local level supported by global leverage. By looking inwards, the vast and often disparate global health community can reflect on success stories and move forward through action, investment, and accountability. Image Credit: Nana B Agyei, Flickr.